Water is an essential part of any outdoor recreation, that’s why it’s so important to know how to clean a Camelbak or any other similar hydration reservoir. There are essentially three ways to do it: rinsing, deep cleaning and disinfecting. We compiled this guide to make your Camelbak cleaning efforts as painless as possible. To keep your water reservoir in top shape, rinse thoroughly with hot water (optional soap) after every use, especially if you’re filling it with anything other than water. In any case, the key here is the DRAIN and DRY. Because all the reservoirs on the market (by Platypus Hydration, Camelbak, Osprey or Deuter) are soft-sided, they’re tough to dry with the sides sticking and trapping moisture. 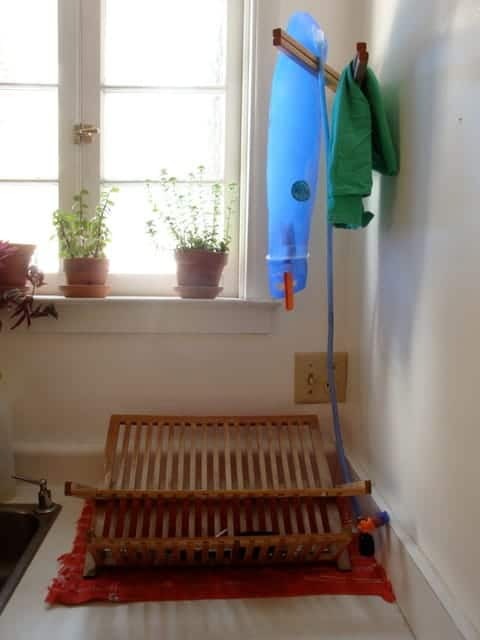 I have a perfect drying set-up at my house with an oscillating towel rack (pictured below, cost about $15 at our local kitchen shop) that is great for hanging my reservoir upside down. I use the orange slider seal on my Deuter Streamer to keep the top open so it dries best; I’ve also read of people using a Q-tip to prop open the top. However you choose to dry your reservoir, remember it’s one of the most important steps you can take. The deep clean should also include brushing out the inner surface, including the tube. I use the CamelBak Cleaning Kit, which includes brushes for the tube and reservoir. Simply disassemble all the parts and give them each a scrubbing. 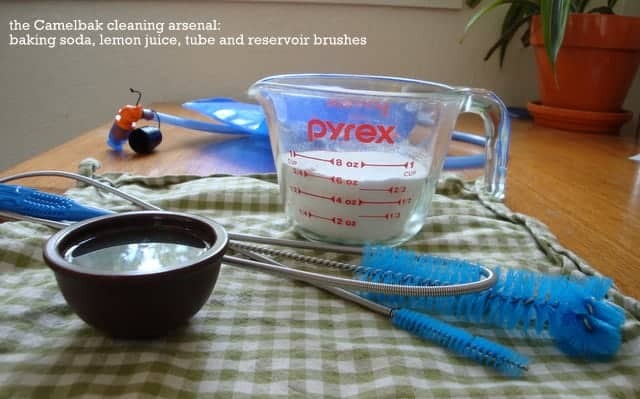 I brush AFTER the baking soda/lemon application to help clean out all the baking soda residue. A note about bite valves: When doing the deep clean and brushing, it’s best to remove the bite valve to make it easier to clean the whole tube. It’s a bit hard to get it off the tube though. Anyone have a good method? I am notorious about forgetting my reservoir, leaving it in a dark pack, half-full, for several days, even weeks sometimes. Sadly, this happened in a bad way after I did the Great Ski Race this year. I didn’t have any liquid left in the reservoir so I didn’t bother rinsing and cleaning, but it turned into a nasty case of mold since I was using an electrolyte mix during the race. If this happens to you, it’s time to bring out the big guns and disinfect your Camelbak or other brand-name reservoir. Disinfecting takes general cleaning a step further by killing microscopic organisms. Most all experts recommend using bleach, or a chlorine-free alternative like CamelBak Cleaning Tablets or, hint-hint, Seventh Generation’s Free and Clear. If you have any tips on how to clean a Camelbak, or cleaning other hydration reservoirs and bottles, let us know in the comments. Previous PostCar Camping Gear List - Our Checklist of Essential Car Camping Gear Next PostMay Powder Skiing - Awesome!!! a pair of kitchen tongs, inserted tong-first through the bladder mouth, helps aid drying by keeping the sides of the bladder apart. i also like to store my empty bladders in the freezer to prevent mold growth in those spots that never seem to dry (corners, hoses, etc). Thanks for the tip! Even with my amazing drying set-up pictured, I still usually give it a wipe with a kitchen towel because it’s so hard to dry. Will try the freezer method. Thanks for this…catching up on some reading. Freezing tip is spot on!! !